Looking for the best Littleton gyms with pools? Whether you’re thinking about swim lessons for your kids, trying to get in shape with water aerobics or just looking for a place to relax and enjoy some time in the water, Club USA is the place to be! Our Littleton pool is a 17-meter indoor pool that accommodates private swim lessons, water aerobics classes and open swimming with your family. We’re also a gym with a sauna! Join our gym and get access to our aquatics by contacting us at membership@clubusa.net. Swimming is the second most popular sports activity in the United States, and it’s a great way to engage in regular aerobic activity. According to the CDC, just two and a half hours per week of aerobic physical activity – like swimming – decreases the risk of chronic illness. Water-based activities help with chronic diseases like arthritis. Swimming can also boost mood and improve mental health. Water-based activities are ideal for older adults as they decrease disability and improve quality of life. In post-menopausal women, regular swimming maintains and even improves bone health. Some gyms with pools don’t give much thought to all the health benefits and water exercise classes an indoor pool can offer, but Club USA does. Our pool hosts group exercises classes as well as private swim lessons. Whether you’re thinking about enrolling in a class, registering your child for private swimming lessons, swimming laps or taking the kids for a swim, we recommend checking the pool schedule or contacting us at 303-979-7772 or membership@clubusa.net. Our friendly staff can’t wait to see your kid have a great time while you workout! In the pool area, we also have a co-ed sauna and co-ed steam room. The spa area is a great way to relax at the end of your workout. Whether you choose our Littleton sauna or our steam room, both provide many benefits. A gym with a sauna and a steam room provides members a chance to increase the temperature of the body, bringing about what is known as “deep sweating.” Deep sweating flushes toxins from the body and purifies the skin. Spend some time at Club USA, a local gym with a steam room and a sauna, and relieve some stress, improve cardiovascular performance, and induce deeper sleep and even burn calories. 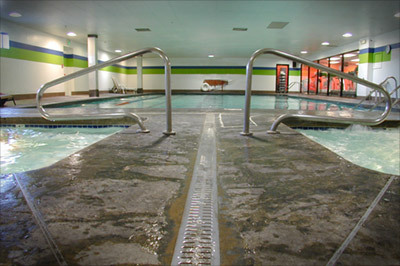 Club USA Fitness is one of a few select Littleton gyms with pools, saunas, steam rooms, and hot tubs. 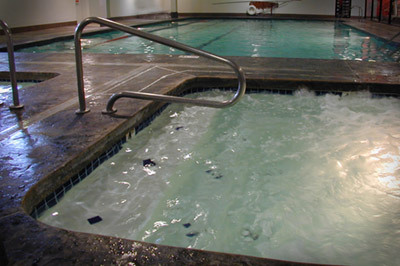 Club USA features two large hot tubs to soothe your body after an energetic group fitness class. One for adults with a higher temperature. The other for moms & dads to enjoy with their children. Either way, these large meticulously maintained spa amenities are the perfect way to finish off your workout! There is no need to keep searching for gyms with pools, Club USA Fitness has you covered. To learn more about what is included in our memberships, contact us at membership@clubusa.net.